How many calories in Salmon? We provide you with the Salmon calories for the different serving sizes, Salmon nutrition facts and the health benefits of Salmon to help you eat a healthy diet and lose weight. There are many species of Salmon, but most of what we buy and eat today is farmed salmon. Salmon is normally orange in color, with wild Salmon commonly having a redder color. Wild Salmon is generally less fatty, but unfortunately costs more money to purchase. However, farmed Salmon is still very good for you. Salmon provides a good source of vitamins B1-B3, B5, B6, B12, phosphorus, potassium, and selenium, as well as other vitamins and minerals. They also provide a good amount of protein. Salmon is an oily fish and therefore contains omega-3 fatty acids as well as omega-6. They are thought to help protect against cardiovascular diseases. 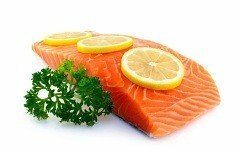 Other Salmon benefits are believed to include acting as an anti-inflammatory with respect to our joints and a lower risk with a number of different types of cancer. Compare calories in Salmon with the other calories in fish. Scientific Name: Salmo salar L.
This smoked salmon and potato frittata recipe is quick and easy to make and can be ready in just 20 min if you are using cooked potatoes and 35 min if you are cooking potatoes. The recipe provides a good source of protein, potassium, vitamin B-12, vitamin B-6, vitamin C, copper, niacin and phosphorus. 30 min of your time and simple ingredients such as salmon, sour cream, lemon juice and dill will make you a yummy dinner or lunch with 313 calories and 6g of net carbs per one serving. The recipe can be served with sauteed garlic zucchini.